Door and threshold are deep metaphors in almost all sedentary cultures and languages of the world. The near-universal metaphorical significance of the door, while impossible to date, probably developed early in human history, because of the door's vital role as a border between the inside and outside of inhabited space. Crossing the threshold means abandoning one space and entering the next, a practice recognized both in ritual and in language as a transition from one social role to another. Doors and thresholds are thus closely linked with rites of passage. The door creates a connection between spaces that channels movement and draws the gaze of the beholder. It is also a manifestation of opposition. Doors literally create insiders and outsiders. Door and threshold also create a space between. Standing in a doorway one is neither here nor there, but between spaces, or outside space. Doors are capable of both allowing and denying access to the spaces they guard – creating linkages and oppositions – and it seems that the Viking Age populations used ritualized doors to do both – arguably because of their ambivalent attitudes toward the dead. There are several archaeological variations upon the theme of doors to the dead. Prof. Eriksen's paper is freely available for download from her academia.edu page. T. S. Eliot, Four Quartets, excerpts from a) 'Burnt Norton' (1935), I and b) 'Little Gidding' (1942), V.
Martinus Rørbye (1803-1848), Entrance to an Inn in the Praestegarden at Hillested, 1844. Image: Los Angeles County Museum of Art (LACMA). Rørbye's painting captures not just the architectural and metaphorical aspects of doorways described in the quotations but also presents the emotional tension that the doorway generates in the viewer. 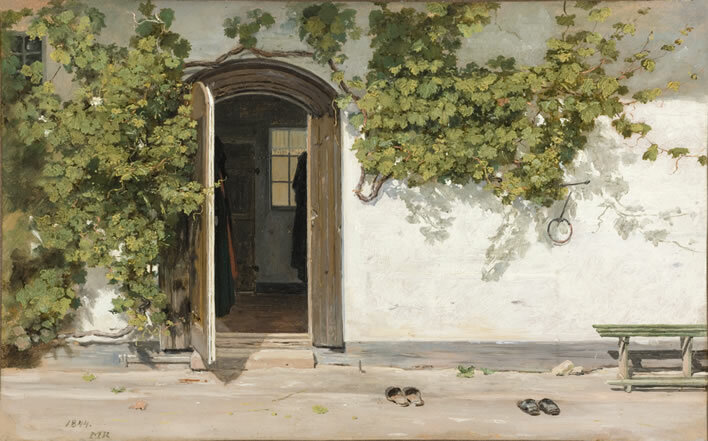 The not quite fully open door in this remarkable painting holds our attention and demands a response: pass by, look in or enter – or is that just my OCD personality speaking?